Craighead House | Where it all began! Sat., April 28 Bring up to 5 plants to exchange starting at 10 a.m. The drawing starts at 10:30 a.m. Take home a new plant in exchange for each one you brought. 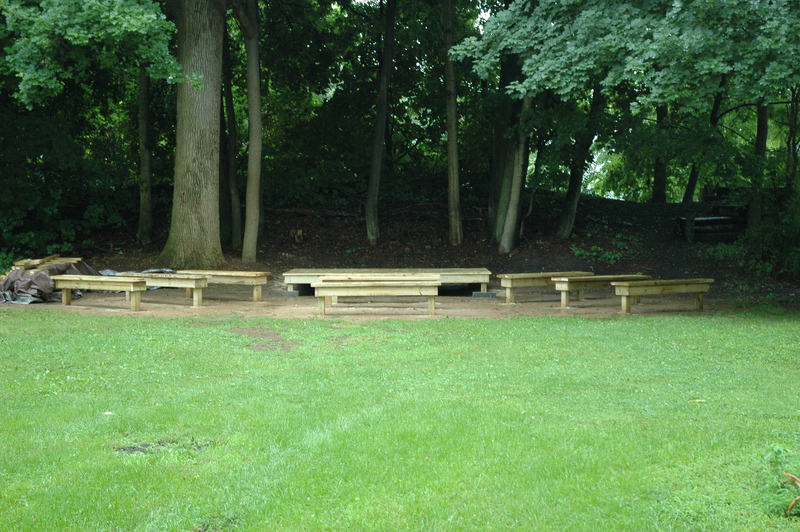 Designing a Pollinator-Friendly Garden Sat., April 28 11 a.m.
After all plants are exchanged a Penn State Extension Master Gardener will present a program in Craighead’s outdoor education center on the banks of the Yellow Breeches Creek on How to Create a Pollinator-Friendly Garden. Learn how you can beautify your gardens, improve the environment, and encourage helpful pollinators such as butterflies and bees. Starting in June, Craighead House and Laurie Craighead Rudolph will offer a new program for kids: reading The Summer of the Falcon. The book will generate discussion about the adventures of June Pritchard and her pet hawk, Zander. Readers will enjoy the place of inspiration for author Jean Craighead’s book, the Craighead family’s summer home. Special “feathered” guests might attend, if we’re lucky!?! The cost is $10.00 per book. Laurie will also share pictures from the 1930s and children will be asked to read ahead until the next time. There will be three sessions of this class. Families can share books and assistance with the cost will be possible. Adults can accompany their child. Also new this year will be a Water Balloon Battle in July that will more than just a fun way to cool off. As part of the clean up, we will discuss the environment and why to keep our land trash free and how small items can injure wildlife. Two “Game Nights” with Parcheesi, Old Maid, Whiffle Ball and Croquet are also planned for August. Details on these programs will be published soon. The Summer of the Falcon book discussion Weds., June 27th 6 p.m. to 8 p.m.
Parents: Please note that this book is geared for children 9 to 12. Limit of 15 children for this group. Metal Detecting Weds., June 6th 6 p.m. to 8 p.m. Tubing Weds., June 13th 2 p.m. to 4:30 p.m.
Meadow Trip Thur., June 21st* 2 p.m. to 5 p.m.
We will seine for crayfish and minnows, then come back to Craighead for a “Not so Creepy Critters” adventure including testing the PH-acidity in the YB creek. *The first day of summer, yea! Sunday, October 22 at 2:00 p.m.
Dr. Cotten Seiler, Professor of American Studies at Dickinson College will discuss the settling of the valley by immigrants from Scotland and Ireland and their impact on the valley’s history. Hint. Consider some of the local place names and the locations of Presbyterian churches. 2017 marks the 85th anniversary of the first hunting falcons trained by teenagers John and Frank, Jr. Craighead at their family’s summer home on the Yellow Breeches Creek. 2017 also is the 80th anniversary of the twins’ first article in The National Geographic Magazine, “Adventures with Birds of Prey”. Perennials Exchange; bring zero to five plants and take home new ones. Sat. April 29, 2pm: Create a Pollinator-Friendly Garden with Penn State Master Gardener Ruth Osborne. Sat. May 6, 2pm to 5pm: Games and Fun from Pre-TV Days; Play games from the 1930s—badminton, dodge ball, croquet, Wiffle ball & board games. Ages 6 and up. RSVP. Wed. May 10, 6pm to 8pm: Make a Gift for Mom; Ann Howell Woods will assist children with two Mom’s Day projects. Ages 4 to 10. RSVP. Tue. May16, 6pm to 8pm: Fishing at Craighead; Bring your rod and bait or contact Laurie if you need a rod. No RSVP unless rod needed. All ages welcome. Sat, May 20, 3pm to 5pm: Not So Creepy Creek Critters; What lives in and around the Yellow Breeches? Find them, learn their story and test creek for its PH chemistry. Ages 6 to 15 or younger if accompanied by a parent. RSVP. Nature Photography by Crystal Hunt; Learn What, Where and How of Capturing the Best of Mother Nature. Open to the public; Ages 12 and up. Tue. May 30, 6pm to 8pm: Metal Detection Exploration; Search for treasure around Craighead; All welcome. Retrieved items stay with Craighead House but child finders get rewards. RSVP. Tue. June 6, 2:30pm to 5:30pm: Tubing and Swimming the Yellow Breeches! ; Our natural water park is open for fun and exploration. 12 tubes will be provided, please bring your own if you can. Wet Fun for all ages! RSVP. Tue.,June 14, 6pm to 8pm: Metal Detecting;Search for treasure around Craighead; All welcome. Retrieved items stay with Craighead House but child finders get rewards. RSVP. Sat. June 17, Making Bamboo Fishing Poles; Final plans and time to be announced. RSVP. Sun. 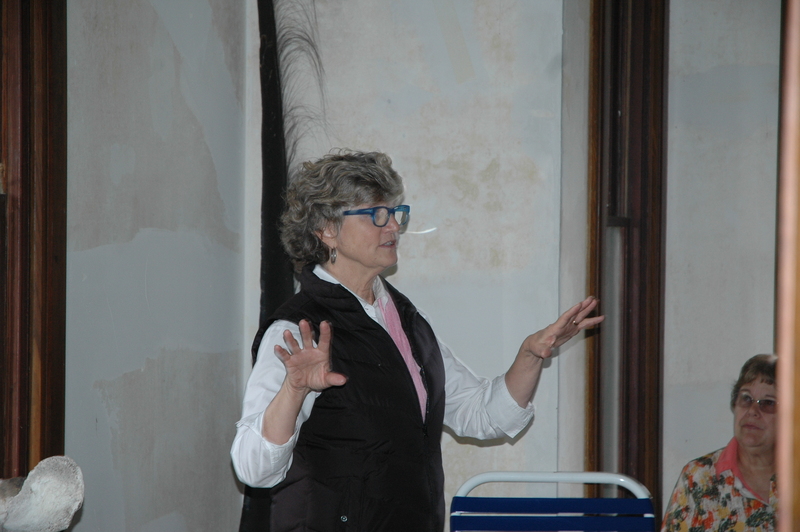 June 25, Master Gardeners Tour; Craighead House will be a stop on garden tour. PA Honey Queen & PA Falconry and Hawk Trust will make presentations. Tue. June 27, 2:30pm to 5:30pm: Tubing and Swimming; Our natural water park is open for fun and exploration. 12 tubes will be provided, please bring your own if you can. Wet Fun for all ages! RSVP. Grab your rake, gloves and water to enjoy a beautiful spring morning at Craighead House cleaning up the sticks dropped by Mother Nature over the winter or left behind from a dead tree that had to be felled to prevent damage to the house. Come and see the new porches and the new paint job. Learn the What, Where and How of capturing the best of Mother Nature. Ages 12 and up. Open to the public. Craighead House sponsors its third annual Perennials Exchange on Saturday, April 29. Bring one to five perennials, of the same or different species (zero if you just want to watch), that you want to trade for something different between 1:00 and 1:30 p.m. and receive a ticket for each plant you bring. Ticket drawing begins at 1:30 p.m. Each person gets his or her choice of plants in the order tickets are drawn. Larry Luxenberg thru-hiked the Appalachian Trail on his first ever backpacking trip over thirty years ago, in 1980. In 1994 he began work on Walking the Appalachian Trail. In six months he interviewed 200 hikers and others deeply connected to the A.T. and combined their stories in his novel account of the trail. In 1998 he began working on the Appalachian Trail Museum (atmuseum.org), which opened on National Trails Day, June 5, 2010, at Pine Grove Furnace State Park. In recognition of his efforts on the book and A.T. Museum he was named an honorary member of the Appalachian Trail Conservancy in 2009. An active dayhiker, in 2008 he became the first person to hike all the trails in Harriman Park in one calendar year. Friday, August 26 at 6:00 p.m. Dusty Wissmath, fly fisherman extraordinaire, and manager of TCO Fly Shop in Boiling Springs will give a talk and demonstation of fly fishing in and around the Yellow Breeches. A house clean up will be held on Saturday, June 18 starting at 9:00 a.m. Bring water and cleaning supplies. Tom Benjey will give a talk on the Craighead Naturalists at the South Mountain Partnership quarterly meeting at 7:00p.m. 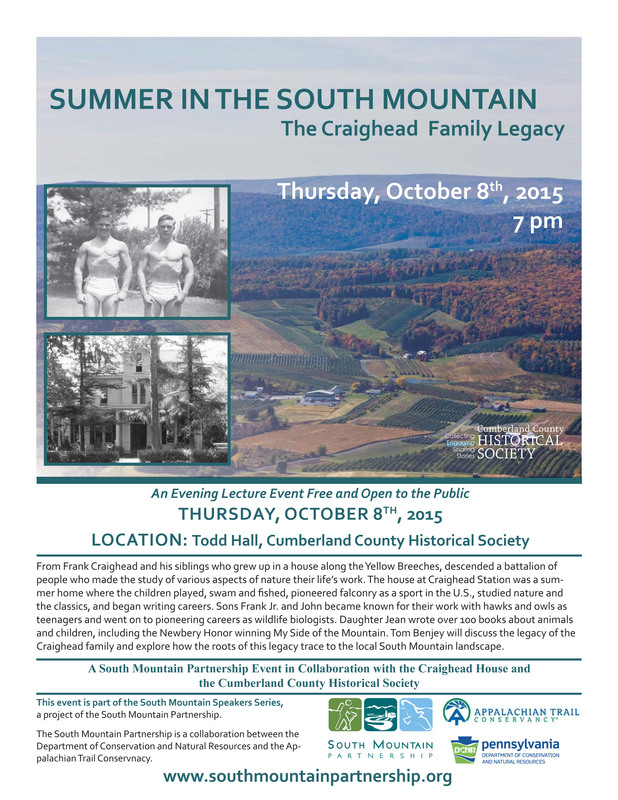 Thursday, October 8, 2015 at Cumberland County Historical Society, 21 N. Pitt Street, Carlisle, PA 17013 as part of their speaker series. Open to the public. Find more information here. Tom Benjey is giving a talk on the Craighead Naturalists at 10:30 a.m. Tuesday, September 22 for the Institute of Retired Persons in the Science Center at Wilson College in Chambersburg, PA 17201. Find more information here. Falconry program postponed one day and two hours to 4:00pm Sunday, September 13 due to rain. Fran Gray, Regional Director of Pennsylvania Falconry and Hawk Trust and active practitioner of falconry, will present an introduction to falconry to young and old alike at the cradle of American falconry at 2:00 p.m. Saturday, September 12 in the outdoor education center along the creek at 318 E Old York Road (Route 174). FREE! Fran Gray with his son, Nate, and two hawks. Classes start at 9:00 a.m. and run to noon. *Materials will be provided, including the bamboo. No fee is being charged for these classes. Students may bring lunch or a snack. Those wanting to read The Summer of the Falcon before the class can purchase copies at Village Artisans Gallery, 101 Café, Whistlestop Bookshop, History on High, AHCF Museum Store, or from Tom Benjey (CraigheadHouse@gmail.com). For more information or to sign up, contact Laurie Craighead Rudolph at rudolphlaurie@ymail.com. On August 6th, Craighead House hosts the Boiling Springs Civic Association for its annual ice cream social. Attendees will be able to tour the grounds and see the recent improvements with the addition of an education center, among other things. Attendees will be able to enjoy the serenity of this historic site as the Yellow Breeches flows by while they enjoy their ice cream. Education Center constructed by Boy Scouts for Matthew Bear’s Eagle Scout project. 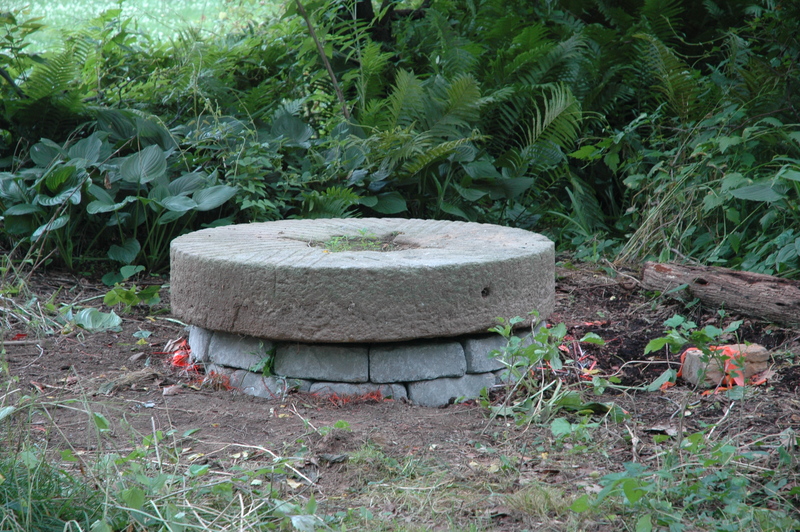 Millstone from one of the Craighead mills repositioned to serve as a teaching and reflection site. John Coyle inspects plants as they arrive. Craighead House hosted its first annual perennials exchange at 1:30 p.m Saturday, April 25. Each participant brought one to five (most brought five) perennials individually packaged in pots or bags and exchanged them for plants brought by someone else through a lottery. A good time was had by all. The weather even cooperated. A talk on falconry will be given at 2:00 p.m. Saturday, September 12 at Craighead House by Fran Gray of the Pennsylvania Falconry & Hawk Trust. Rain date is September 13. Mr. Gray will bring a Harris hawk and, if luck is with us a kestrel and a red-tailed hawk. Open to the public. Bring your lawnchair. Free. July 9 at 11:30 a.m. for Smart Seniors at Cumberland Crossings. September 22 @10:30 a.m. for IRT in Science Building at Wilson College in Chambersburg, PA.
October 8 at 7:00 p.m. for South Mountain Partnership meeting held at Cumberland County Historical Society. As additional talks are scheduled, they will be listed here and on Facebook. Author Talk on Saturday, October 11! Twig George, daughter of Jean Craighead George, will give a talk at Craighead House at 1:30 p.m. on Saturday, October 11 at Craighead House. An author in her own right, Twig and her brother recently put one of their mother’s last books into print. Twig surely has some great stories to tell. The dedication of the PHMC Historical Marker on June 14 came off beautifully. Not counting fishermen, 70 people were in attendance. A photo album of the event has been posted on our Facebook page and The Sentinel site also has a series of photos they took. 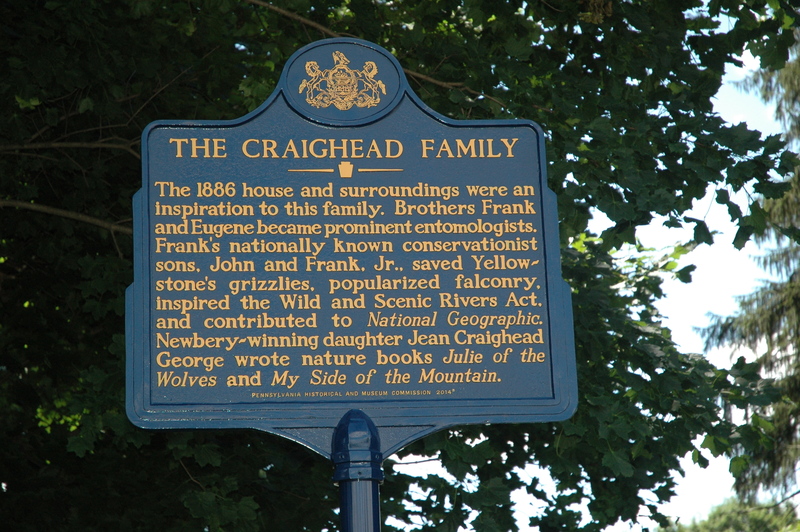 Craighead House is hosting the dedication of the Pennsylvania Historical and Museum Commission Historical Marker honoring the Craighead Family at 11:00 a.m. Saturday, June 14 at Craighead House, 318 E Old York Road in South Middleton Township. An example of a PHMC Historical Marker, the one on Front Street in Boiling Springs honoring abolitionist Daniel Kafman, is shown above. Take Trindle Road toward Carlisle to the intersection with Route 174. Turn left on 174 heading toward Churchtown and Boiling Springs. Go through Boiling Springs and continue for two to three miles. You’ll be getting close when you pass Petersburg Road and almost there when you see Bonnybrook Road on the right. You’ll soon see an old white-brick house on the right and a metal shed on the left. Ahead you’ll see a line of brush on both sides of the road where the railroad tracks used to be. Park next to the railroad right-of-way on either side of the road. The house is on the left. We expect to have fire police helping people park. Take the Hanover Street (Route 34) exit heading south toward Mt. Holly Springs. Proceed a few miles to the light at Route 174. Turn left and proceed past the (now condemned) iron bridge on the right. Craighead House is the 3rd house on the right after the bridge. Park just past the house in the area next to the railroad right-of-way on either side of the road. Take the South Hanover Street (Route 34) toward Mt. Holly Springs. Proceed a few miles past Home Depot to the light at Route 174. Turn left and proceed past the (now condemned) iron bridge on the right. Craighead House is the 3rd house on the right after the bridge. Park just past the house in the area next to the railroad right-of-way on either side of the road. VFW Memorial Post 8851 and Boiling Springs Civic Association have both donatedtoward the substantial cost of the marker but we are still about $1,000 short. Any gift, no matter how small, would be most appreciated.